The American baseball season now moves into playoff mode. 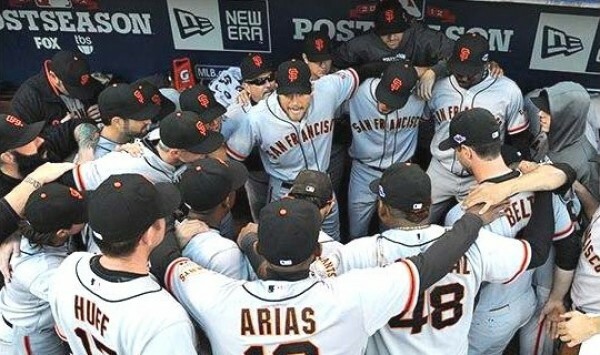 The season is over for my team, the San Francisco Giants, but no complaints with two World Series Championships in the last three years. Win or lose though, I truly love baseball and enjoy the flow of the season. At the end of the Giants season each year, the team members vote for the most inspirational player on the team. The award is called the Willie Mac Award named after my childhood baseball idol, Hall-of-Famer Willie McCovey. Some years the player who wins is pure inspiration and in other years the winner balances inspiration and leadership. This year the winner is the later, a player full of inspiration and indeed, a leader for the team. Hunter Pence is 2013 Willie Mac Award winner. I have written before about how Hunter inspired his team to last year’s World Series Championship against long odds (post here). This year though he settled in as a team leader. When he gave his acceptance speech for this year’s award he did not shy away from his unique approach to baseball and life. Hunter stressed that it was important to tell his teammates each day that he loved them. Indeed some players cringe with each new, “I love you”. During his award acceptance speech Hunter spoke to this and said, “You think it is soft, but I actually think it’s the strongest thing we got.” Yea, not a typical line from a professional athlete. I once read that the English language is lacking when it comes to love. We have just the one word, “love” to describe how we feel about popcorn, sunsets, and our family. How do we describe that close and deeply caring space for our teams … those people we work closely with each day? Hunter Pence, lead the way. Say it out loud. Say it everyday. “I love you guys”. Note: You may want to warn you Human Resources Department before you tell your team that you love them.